Cut through the negative publicity and ensure your organisation is ready for the Royal Commission and the new Quality Framework. Following a series of high profile compliance failures and reports of elder abuse in aged care facilities, further perpetuating a negative perception of the sector, pressure on providers to deliver high quality services is greater than ever. This is exacerbated by the implementation of the Royal Commission into Aged Care which promises further negative press as it uncovers tough stories and will no doubt have significant implications for the future of the industry. At the same time, providers must be ready for the new Single Aged Care Quality Framework and Standards to officially come into force in July 2019. Focusing on consumer directed care, the new standards mandate a shift away from traditional models of care and will require dramatic transformation of organisational processes to prioritise and demonstrate quality of care and quality of life. 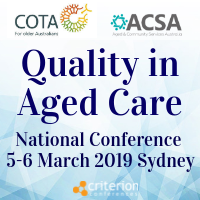 With increased public scrutiny and a strong government commitment to ensure and improve quality, the Quality in Aged Care Conference 2019, is a critical event for all providers of aged care services to take away key insights and information from industry leaders, peak bodies and legislators and prepare their organisations for some of the biggest challenges facing the industry, including the Royal Commission and the new standards. Quote CC*CCR when registering and save an additional $100 off the current price. Group discounts available.